About 900 light years from here, there's a rocky planet not much bigger than Earth. It goes around its star once every hundred days, a trifle fast, but not too different from a standard Earth-year. At least two and possibly three other planets circle the same star, forming a complete solar system. Astronomer Alex Wolszczan discovered planets around PSR 1257+12 in the 1990s using Puerto Rico’s giant Arecibo radio telescope. At first, no one believed worlds could form around pulsars—it was too bizarre. Supernovas were supposed to destroy planets, not create them. Where did these worlds come from? NASA’s Spitzer Space Telescope may have found the solution. Last year, a group of astronomers led by Deepto Chakrabarty of MIT pointed the infrared telescope toward pulsar 4U 0142+61. 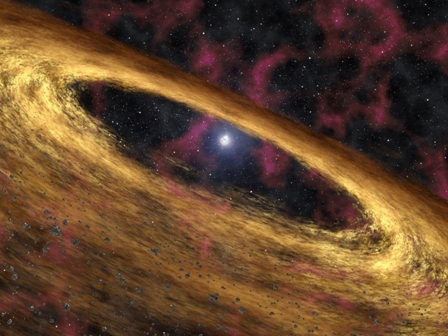 Data revealed a disk of gas and dust surrounding the central star, probably wreckage from the supernova. It was just the sort of disk that could coalesce to form planets!